12 ივლისს, 18:00-დან 21:00-მდე 1/2 ჯგუფმა მოაწყო მათი სამუშაო სივრცის ღია კარის დღე გეოეარის რეზიდენციაში. მათ წარადგინეს ბოლო 6 წლის მანძილზე გაკეთებული პროექტები და პუბლიკაციები და ისაუბრეს, თუ როგორ მუშაობენ დამოუკიდებელი გამომცემლობის სფეროში. მათ, ასევე, აჩვენეს ის სამუშაო, რომელსაც ახორციელებდნენ თბილისში, ვიზუალური ხელოვნებისა და მუსიკის განხრით. On July 12, 2013, from 18:00 - until 21:00 the group 1/2 opened the doors of their working space at the GeoAIR residency. They presented their publication project over the last 6 years, and talked about their way of working in the field of independent publishing. They also showed the work they were making in Tbilisi, in both visual art and music. 1/2 არის ოთხი დიზაინერის/ხელოვანის - ლორ ბოერის, ან-პოლინ მაბირის, ლიუსი პინდასა და კლოე ტომას ჯგუფი, რომელიც დაარსდა 2007 წელს. პარიზში სწავლის დამთავრების შემდეგ, ისინი გადავიდნენ ბერლინში, ამსტერდამში, ვენასა და რენეში. კონტაქტის შესანარჩუნებლად და მათი სამუშაოსა და დიზაინერული კონცეფციების გაცვლისათვის, მათ დაარსეს ონლაინ სივრცე. 2007 წელს მათ გამოსცეს ეპონიმური პუბლიკაცია, ორიგინალური ხელნაკეთი წიგნი. ამის შემდგომ, წელიწადში ორჯერ ისინი გამოსცემენ ახალ წიგნს სხვადასხვა ქალაქებში და აერთიანებენ ერთმანეთის კავშირს. თბილისში, ახალ კონტექსტში, ახალ ხალხთან ერთად 1/2-ის შემდგომი ნამუშევრის გამოცემა მათთვის დიდი ნაბიჯი და გამოწვევაა. 1/2 is group of four designers/artists: Laure Boer, Anne-Pauline Mabire, Lucie Pindat and Chloé Thomas. They founded 1/2 in 2007. After they graduated in Paris, they moved to new horizons in Berlin, Amsterdam, Vienna and Rennes. In order to keep contact and exchange their work and design conceptions, they created an online space. In 2007 they published the eponymous publication, a biannual original self-published and hand-made zine. Since then, twice a year, the new issue has been launched in a different city, bringing together each other’s network. Creating and publishing the next issue of 1/2 in Tbilisi, in a new context with new people, is a great step and interesting challenge for 1/2. 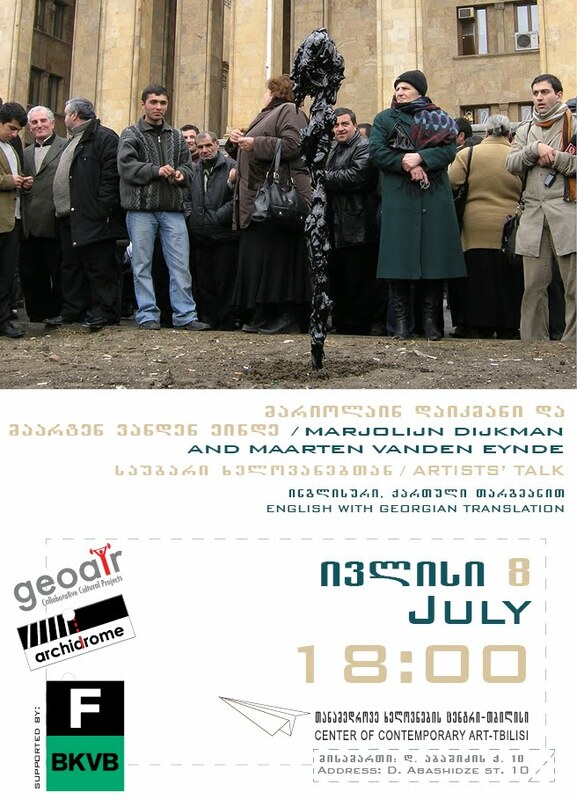 1/2 was invited by GeoAIR for one-month residency stay in Tbilisi, Georgia in July 2013. 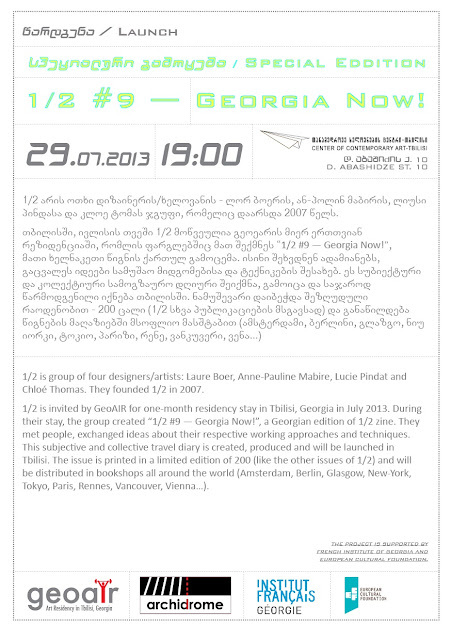 During their stay, the group created “1/2 #9 — Georgia Now!”, a Georgian edition of 1/2 zine. They met people, exchanged ideas about their respective working approaches and techniques. This subjective and collective travel diary was created, produced and launched in Tbilisi. The issue was printed in a limited edition of 200 (like the other issues of 1/2) and will be distributed in bookshops all around the world (Amsterdam, Berlin, Glasgow, New-York, Tokyo, Paris, Rennes, Vancouver, Vienna…). პროექტს ფინანსურად მხარს უჭერს საქართველოს ფრანგული ინსტიტუტი და ევროპული კულტურის ფონდი. The project is supported by French Institute of Georgia and European Cultural Foundation.